This is an address given at the invitation of the German Dharmaduta Society to commemorate the second death anniversary of Asoka Weeraratna (later Ven. Mitirigala Dhammanisanthi Thero) at the Mahaweli Centre Auditorium in Colombo, Sri Lanka on the 7th of July 2002. The challenge that Buddhism faces today is not with the Dharma itself, the Buddha's teaching - as the timeless message embedded in the Four Noble Truths maintains its validity - but how to present this ancient teaching as a meaningful alternative to people who have been shaped by the values of the consumer society. There is a new era of technological innovation sweeping the world, which has spawned a new medium - the Internet's World Wide Web, a very powerful communications network and learning environment. The Internet should not be seen as just a new way to disseminate or repackage the Buddha's teachings but potentially as a base for an innovative online Dharma Community - a Cyber Sangha, that offers alternative social and spiritual values. On what grounds can we realistically predict the future of the Internet? Well we can get some idea from the trend in the online growth. At present about 6% of the world's population uses the Internet. Almost one billion people, or 15 per cent of the world's population, are predicted to be using the Internet by 2005. Last year, the US accounted for 34 per cent of Internet users, Europe 29 per cent and Japan 10 per cent. By 2005, web use in Europe and Asia will outpace that of the US. And according to reports, the spread of mobile phones and other devices that link users to the Internet will add to this increase. In less-developed nations, the reality is that, most people lack access or cannot afford the Internet or modem communications. Overall, about 400 million of the world's six billion use the Internet daily. Those growing up on the Internet will one day make up the bulk of the population and there will be very few nonusers down the road. When you look at online religion - it can only be expected to boom. Eight per cent of adults and 12 per cent of teenagers in the US use the Internet for religious or spiritual experiences, and the number is likely to grow rapidly, according to a study. So in spite of the drop in interest in mainstream religions and increasing secularization, which is the view that one's life can or should be carried out without a religious element, the age-old search for meaning has found the new medium - the net. The linking together of the world's population in the globalised economy is undermining the individual's ability to function as a cooperative, responsible member of their society. This happens because the ultimate effect of corporate culture is to reduce the person to a mere consumer, on the assumption that happiness can be achieved through acquisitiveness and the enjoyment of goods. Buddhism has within it a social dimension that can address global problems, a way to "heal the wounds of the world". This way is the Buddha's Noble Eightfold Path, the practice of which while personal, requiring individual effort has consequences that are deeply social. So there is a need now for the socially engaged side of Buddhism to be combined with personal growth and the path of liberation as the answer to the individual's alienation. It will require radical changes before we can see any alternative to current values and attitudes. Yet the Internet could bring about such a social revolution in values, as the corporate world, try as it might has not yet succeeded in dominating it. If we creatively use the technology, the Net can cater for the religious or spiritual side of human nature and the means of offering care and compassion in this digital world. Buddhism with its ancient teaching and cultures must seize the opportunity and adapt itself so that it can make a meaningful contribution to the social and spiritual needs of the inhabitants of this blue planet via this new medium. While Buddhism is not a religion that proselytes, that is, seeking to win over or convert, it certainly has a sense of its own mission in spreading its message. In the past the Buddha's Teachings spread slowly, not only due to the limitations of ancient communications, but because it needed to make a local adaptation to each new culture it encountered. For example, it took the Buddha's Dharma about 500 years to go from India to China. It is not only the time factor, but also the need to transform itself into "Chinese Buddhism". That is, it had to accommodate itself to the indigenous religions and philosophies. Taoism and Confucianism, before it was acceptable locally. But in the process of accommodating itself to the local culture the Teaching is transformed and can be very different from the original. The difference in a Globalised World is that the acceptance of the Buddha's teachings does not depend on whether it can accommodate itself to a particular culture or religion but the appeal of its core insights. In fact the cultural accretion has to be differentiated from the core understandings before it can be seen to resonate with universal truths. So, in an increasingly secular and Globalised World where technology and scientific appraisal is all pervasive, the Dharma or Truth itself stands alone. The challenge now is can the Sangha, that is, committed communities of Buddhists, use the tools and acquire the skills of the Digital Age? And further, can we find new ways and means of presenting the Buddha's teachings that are relevant to the digital world rather than the traditional methods of sermons and ritual that has little or no appeal to the technocratic generation. It's not just technical skills that are needed but the motivation of selfless service and compassion - core values of the Buddha Dharma as expressed in the ancient Bodhisattva ideal. It is becoming increasingly self-evident that we have to move from the limitation of individual and national boundaries to a worldview of a shared planet. 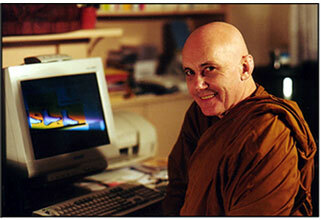 If such a notion as a Cyber Sangha is to come into being - and realistically it will probably take a generational change - it will either come about when young monks in the scholarly tradition in Buddhist countries go online or more likely, as is happening now, the new generation of Western Buddhists, who are not on the whole conditioned by a particular Buddhist culture, produce more appealing e-Dharma content for its own. For the traditionalists - hankering for the past - there can be no going back, as it would be foolish to think that one can create some sort of "Virtual Temple" based on ritual and ceremony. Or that one can recreate the particular cultural customs of Buddhism on the net, which unfortunately the pure Buddha's teachings have become so embedded in. The role of an online Sangha is to offer a spiritual alternative while dissemination the Dharma through E-learning (electronic Dharma). This would need to go hand in hand with the servicing of the needs of people who are experiencing negative aspects of the Globalised Economy - the pressures and stresses it creates. In a rapidly changing digital world, where many are stretched and stressed, we need to come to terms with the effects of such stress and pressure on the human psyche. I'm not suggesting that we create some 'virtual utopia' as the Dharma tells us that there is no certainty and that things are inherently unstable and insecure. The experiential knowing of this Insight allows us to let go and be free of clinging to that which is known, to block the flow. This acceptance of change and the ability to work with it is in the words of Alan Watts the "Wisdom of Insecurity". The Internet gives us many opportunities to promote Buddhist values, understandings and Insights on a global scale. Buddhism has survived materially until now because of the practice of "Dana", which is a culture of sharing and service, as opposed to the greed culture based on monetary values. This leads to misuse of the technology, as the motivation is merely to make a dollar, as we have seen in the recent collapse of the Dotcoms, which views the Internet as a market place it can exploit. In contrast to this we have the example to the earlier BBS (Bulletin Board System), which had a culture based on a genuine sharing and learning community offering a largely free service operated by volunteers. This is the way an online Dharma Community will ideally operate - as a focal point, a hub for community sharing and support. In the spiritual vacuum called the Modern World - with its preoccupation with having it all, there is a need to make known the contribution that Buddhist mental culture can offer. The techniques of meditation, for example, can be explained and illustrated very well on the Net through streaming audio and video, with the student being guided by an online teacher. The characteristic of the Internet is its interconnectivity - global interdependence. This is a core Buddhist understanding, a universal truth. Its appreciation leads to the maturity that moves from an ego-self preoccupation to an interconnectivity that empathizes with all suffering life. There will be a new emphasis on lifelong learning, on training and retraining, of development and innovation. This era of all-encompassing change will need to be accompanied by an ability to cope with the pressures caused by the new technologies, without becoming overextended and stressed. So we will need to have the skills to manage our own mental health through the healing practices and Insights that the Dharma can give us. We are seeing that the psychological and healing side of Buddhism is being utilized by modern Psychotherapy, that there has been a shift from what were predominantly the ritual needs of lay people, to a search for help and support in an increasingly alienated world. So counselling services in the form of interactive multimedia via the net is the way of the future, as is demonstrated by the popular "chat culture" on the Net. It is to be hoped that a Cyber Sangha would be supported by, or be an extension of the locally based Buddhist establishments, as it evolves into a network of like-minded people - lay and ordained - who come together as an online community - followers of the Buddha - living out the Insight of the Dharma and communicating the Buddha's message of intelligence and compassion in this new Digital World. E-learning or Electronic Buddhist learning can become a tool for spiritual as well as social development, when access is improved and learning techniques are refined. The reality is that it can never altogether replace face-to-face teachings but has added a new delivery medium that allows for skill-enhancement and easy accessible training. The worldwide Buddhist community will need to develop its own e-learning content with the traditions coming together and pooling their knowledge and skills and researching new ways of presenting the Buddha's Teachings out of compassion for this suffering world. It has never been considered that the Buddha's teachings are to be found only in the text, actually in the past the Dharma was transmitted as much through oral teachings. There is a temptation to merely dump data (facts) online rather than exploit the new ways of presenting information that the technology provides. Data and information do not necessarily translate into knowledge. The temple approach in teaching the Dharma is through sermons with the teacher and the content being unchallenged. The new way is through group learning via discussion. On the Net its through chat groups where the teacher or moderator acts as a facilitator for an ongoing debate or discussion. The benefit of Internet learning is that you have access to information, and you also have access to other people, students or experts. It's the combination of the two that provides an extra dimension than most other technologies. In fact what is happening now is that students are looking for resources themselves and then interacting with them. Learning from animated characters that act as virtual teachers, could be the future of online learning. Experts predict that successful electronic learning computer programs will become more sensitive to human nuances and motivation - software that initiate human interaction. Until recently exaggerated publicity or hype in the news media about the Internet was common, but with the collapse of the Dotcoms we can take a more sober view of the situation. The reality was and is more of a digital divide, which is a term for the difficulties some groups in society face in even getting access to computers and the Internet. This especially applies to the economically disadvantaged Buddhist countries in the Theravada tradition, Cambodia, Myanmar and here in Sri Lanka. Online technology is unequally distributed because access to and use of computers and the Internet mirror the socioeconomic divide between rich and poor individuals and nations. Another factor is that the English language dominates cyberspace so students and others with little or no understanding of English are often denied access to online learning. Although this is changing as the Net is becoming more multi-lingual. The True Buddhist Teaching or Not? Another matter that we will have to face is how can we know that what is posted on the Internet is an authentic Buddhist Teaching or not? The way to judge this is to match what is posted with the Four Noble Truths as all Buddhist traditions accept the Four Noble Truths as the structure for their practice in one form or another. But there have been individuals who make extravagant, even bizarre claims to some special knowledge or Enlightenment. I can suggest at least one way to judge this. The transmission of knowledge in Buddhism is essentially based on lineage, which is the verification of the students understanding by a lineage teacher or master. While there is a purely text based teachings, the scholarly tradition, the practice of mental culture is based on experiential learning which can be checked by a lineage holder. So whether the postings on the Internet claiming to be the Buddha's Dharma are authentic Buddhist Teachings or not, or whether it is just the concoction of a cult - could be checked through its lineage, or lack of it. While for some it may seem rather futuristic, broadband and interactive technology promises an enormous expansion of the potential of the World Wide Web to create a true online community and enhance online learning. On the other hand, we have to work with the current limitations until the interactive technology matures. And especially, we will have to come to terms with the realities in Buddhist countries that are being left behind in the information revolution. One way to address this problem is the use of hybrid technology. To this end we are developing ways to deliver e-learning content via the text-based material on the Web or through Intranets using CD-ROM. For example, BuddhaNet has produced a CD-ROM on "Buddhist Studies for Primary and Secondary Students" that can be use on an Intranet in schools or Dharma centres. The CDs is actually a web page (HTML files) that includes Adobe PDF (Portable Document Files) documents of all of the material, which when printed can then be photocopied. Also we have produced a multimedia CD that interfaces with our web site, and includes over sixty Buddhist eBooks. The traditional temples and bricks and mortar centres will continue to service people needs for the Dharma, yet this can be expanded and enhanced, and may I say made more relevant, if the evolving Cyber Sangha, who need resources, is supported in its aim to develop the Dharma online using the latest technology that is available. Because a teaching is ancient that doesn't mean that it cannot sit comfortably with the new technology. If the Buddha were alive today, he would surely be at ease in the digital world. There is a new generation growing up with the Internet's technologies, who regard it as the natural place to find information, for online learning and for spiritual and emotional support. Can we hope that it will be a place that one goes to have a meaningful experience of the Buddha's Dharma as well - it's the future! * Venerable Pannyavaro is the Webmaster of Buddhanet, President of the Buddha Dharma Education Association and a Vice-President of the World Fellowship of Buddhists.